"The lady investigators pursue missing pigeons in 1920s Kent..."
Walmsley Parva, a village in post-Great War Kent, England, is the setting for this second Beryl and Edwina mystery. The two ladies are friends who share accommodation and are presently without funds, so when a local man goes missing they decide to try their hand at being (paid) private detectives. Beryl Helliwell is American and divorced with a reckless history, while Edwina Davenport is a local lady who worked in the Women's Land Army. In MURDER FLIES THE COOP, the man who is missing is a local pigeon fancier, who is treasurer of the pigeon racing club. At this time, the working men would race pigeons over short distances while middle-class people would subscribe to a club, take trains to release pigeons from a distance and time their arrival back to their coops. Vicar Lowethorpe, another pigeon fancier, is concerned for the whereabouts of Lionel Cunningham, the club's best racing birds, and some of the club's money. Maybe something has happened to the man, or maybe he has just absconded. The period of the story will interest some readers, when women had gained the vote for the first time, had been working in men's jobs during the war, and often remained unmarried because too many men had been killed or severely wounded. At the same time, if you are used to a fast-paced story, the endless niceties, formal speaking and keeping up appearances may make for a slower tale than usual. The odd Americanism, like a disdain for Prohibition in the States, from Beryl, adds contrast to the staid English manners. Another village called Pershing Magna is the start for a pigeon race so we get to meet some of the followers. We also meet coal miners, a way of life largely vanished from Britain today, and hear of the risks they run. The venues for investigation include allotments, a boarding house, tea rooms, and a colliery, so plenty of variety as we see how the ordinary people of the time may have lived. A murder is not an entirely respectable matter for ladies to investigate, but Beryl and Edwina manage with aplomb, fortified by the odd martini and gin fizz. They also resolve the issue of why a certain person wins too many races. And the two stalwart friends go somewhere that no Agatha Christie heroine would ever dare to tread. Fair play to them! 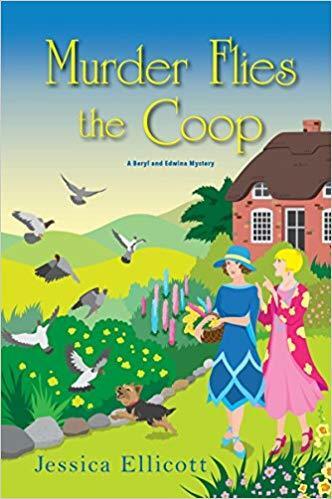 MURDER FLIES THE COOP is by Jessica Ellicott who lives in New England, and the first book in this series is called Murder In An English Village. The adventures will grow on you. One would hardly call them birds of a feather, but thrill-seeking American adventuress Beryl Helliwell and quietly reserved Brit Edwina Davenport do one thing very well together�solve murders . . . Sharing lodging in the sleepy English village of Walmsley Parva has eased some of the financial strain on the two old school chums, but money is still tight in these lean years following the Great War. All of Beryl's ex-husbands have proven reluctant to part with her alimony, which is most inconvenient. So when the local vicar�and pigeon-racing club president� approaches them with a private inquiry opportunity, the ladies eagerly accept. There's been a spot of bother: the treasurer has absconded with the club's funds and several prized birds. Beryl and Edwina hope to flush out the missing man by checking his boardinghouse and place of employment at the coal mine. But when they visit the man's loft, they find their elusive quarry lying in white feathers and a pool of crimson blood, stabbed to death�the only witnesses cooing mournfully. After a stiff gin fizz, the ladies resume their search for the missing funds and prized birds�and now a murderer. Beryl and Edwina aren't shy about ruffling a few feathers as they home in on their suspects. But they had better find the killer fast, before their sleuthing career is cut short . . .